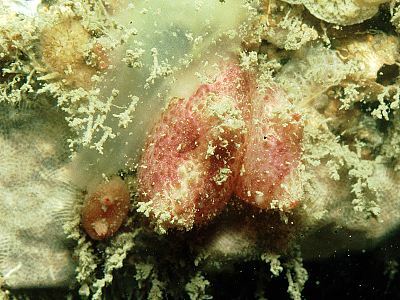 Description: This solitary ascidian has a scaly appearance to the test and is normally found beneath rocks. The siphons are short and are placed at each end of the rather flattened body. 5mm tall by 15mm broad. Habitat: Usually found beneath rocks in sites exposed to wave action or tidal streams, where there is no sediment beneath the rocks except coarse gravel. Similar Species: Pyura squamulosa also has a rough test, but without the scaly appearance of this species. Picton, B.E. & Morrow, C.C. (2016). Pyura tessellata (Forbes, 1848). [In] Encyclopedia of Marine Life of Britain and Ireland.